Unimodal: a power-law function characterized by its slope as a free parameter. The standard Salpeter (1955) IMF is obtained when the slope value is 1.3. Bimodal: similar to the unimodal IMF for stars with masses above 0.6 Mo, but decreasing the number of the stars with lower masses by means of a transition to a shallower slope. Its slope is the only free parameter (as in the unimodal case). 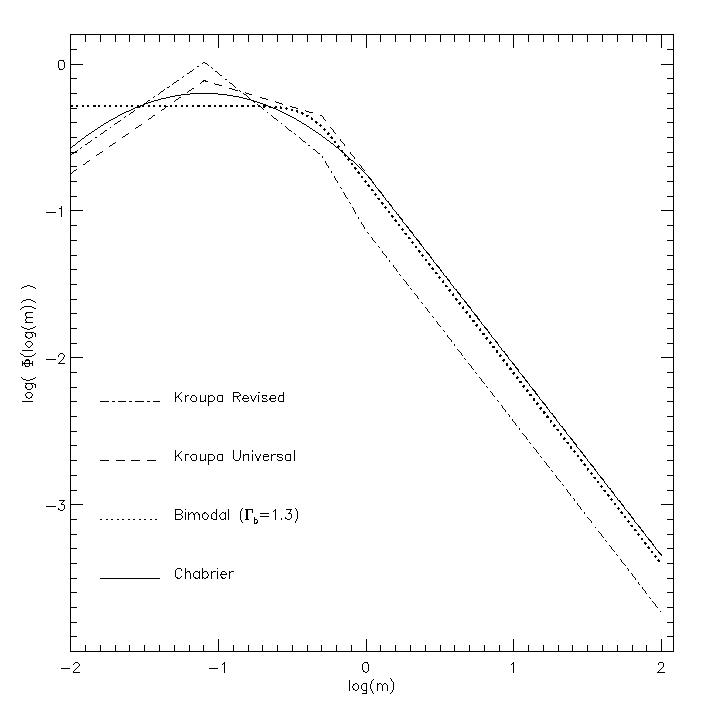 Kroupa (2001) universal: a multi-part power-law IMF, which is similar to the Salpeter (1955) IMF for stars of masses above 0.5 Mo, but with a decreasing contribution of lower masses by means of two flatter segments. Kroupa (2001) revised: a multi-part power-law IMF, in which the systematic effects due to unresolved binaries on the single-star IMF have been taken into account. Chabrier (2003): a multi-part power-law IMF. -enhanced models of Pietrinferni et al. (2006). The latter two will be regarded hereafter as BaSTI. The Padova isochrones cover a wide range of ages, from 0.063 to 17.8 Gyr, and six metallicity bins (Z = 0.0004, 0.001, 0.004, 0.008, 0.019 and 0.03), where 0.019 represents the solar value. The isochrones also include the later stages of stellar evolution, using a simple synthetic prescription for incorporating the thermally pulsing AGB regime to the point of complete envelope ejection. The range of initial stellar masses extends from 0.15 to 7M⊙. The input physics of these models was updated with respect to Bertelli et al. (1994) with an improved version of the equation of state, the opacities of Alexander & Ferguson (1994) and a milder convective overshoot scheme. A helium fraction was adopted according to the relation: Y= 0.23 + 2.25Z. We also use here the BaSTI theoretical isochrones (http://www.oa-teramo.inaf.it/BASTI). The original sets of models have been supplemented by additional computations specifically performed for our project. The BaSTI metallicity grid adopted in present analysis was based on 12 grid points: Z = 0.0001, 0.0003, 0.0006, 0.001, 0.002, 0.004, 0.008, 0.0100, 0.0198, 0.0240, 0.0300 and 0.0400. For each metallicity, the isochrone age range covers the interval from 0:03 to 14 Gyr, with a fne age grid. See Vazdekis et al. (2015) for more details. Stellar photometric libraries are used to transform the theoretical parameters of the isochrones to magnitudes and colours. We use extensive empirical (not theoretical) stellar libraries to obtain each colour as a function of temperature, metallicity and gravity. We use the metallicity-dependent relations of Alonso, Arribas & Martinez-Roger (1996,1999) (A&A,117,227; A&AS,140,261) for dwarfs and giants respectively. This treatment for the giants is the most important difference with respect to the models of Vazdekis et al (1996), where we used the calibrations of Ridgway et al. 1980 (ApJ,235,126) and Johnson 1966 (ARA&A,4,193). The empirical (not the theoretical) compilation of Lejeune, Cuisinier & Buser (1997, 1998) (A&AS,125,229; A&AS,130,65) are used for the coolest and hottest dwarfs (Teff<4000K) and giants (Teff<3500K), respectively, for solar metallicity; a semi-empirical approach was applied to other metallicities on the basis of these relations and the model atmospheres of Bessell et al. (1989,1991) (A&AS,77,1; A&AS,89,335) and the library of Fluks et al. 1994 (A&AS,105,311). We use the metal-dependent bolometric corrections given by Alonso, Arribas & Martinez-Roger (1995,1999) (A&A,297,197; A&AS,140,261) for dwarfs and giants, respectively. For the Sun we adopt the bolometric correction -0.12, with a bolometric magnitude of 4.70. A number of absorption line-strengths computed on the basis of the, so-called, empirical fitting functions. These functions describe the strengths of, previously defined, spectral features in terms of the main atmospheric parameters. 25 absorption features at resolution (FWHM~9Å) are calculated on the instrumental dependent LICK/IDS SYSTEM using the fitting functions of Worthey et al. 1994 (ApJS,94,687) and Worthey & Ottaviani 1997 (ApJS,111,377). The break at 4000A is calculated using the fitting functions of Gorgas et al. 1999 (A&AS,139,29). Using the fitting functions of Cenarro et al. 2002 we compute the CaII triplet feature around ~8600A at resolution 1.5Å (FWHM) and flux-calibration response curve. Spectral energy distributions (with flux-calibrated response curve) at moderately high resolution are computed for the UV spectral range employing the NGSL (Gregg et al. 2006, in Koekemoer A.M., Goudfrooij P., Dressel L. L., eds, The 2005 HST Calibration Workshop: Hubble After the Transition to Two-Gyro Mode. NASA, Goddard Space Flight Center, Greenbelt, MD, p. 209), the optical employing MILES (Sánchez-Blázquez et al. 2006, Falcón-Barroso et al. 2011), the near-IR around the CaII triplet feature using the CaT stellar library of Cenarro et al. (2001) and the Indo-US (Valdes et al. 2004, ApJS, 152, 251) and redward 0.9 micron making use of the IRTF library (Cushing et al. 2005; Rayner et al. 2009). In the optical range we also employ a theoretical stellar spectral library (Coelho et al. 2007) to compute model SEDs based on MILES with variable α-enhancement abundance ratio. Finally, we also produce a specific set of models with varying [Na/Fe] (La Barbera et al. 2017) and spectra in the optical range at FWHM=1.8Å on the basis of the stellar spectral library of Jones 1999 (PhD thesis, Univ. North Carolina at Chapel Hill).